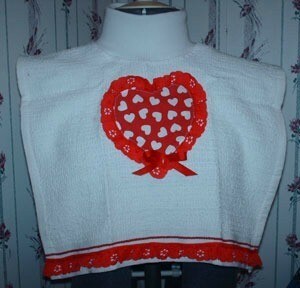 Valentine towel bibs can easily be made with just a couple of fabric items. You just take a simple tea towel or dish towel and fold over one end about 5 inches, cut a u-shape in the center and then add ribbing fabric to the neckline with a single machine straight stitch. For Valentine's Day, I have sewn on the center front a fabric Valentine print in a heart shape, added red eyelet lace around the heart and along the bottom side. Simply slip it over the head and wear to keep clothes from becoming stained then just toss it in the wash as usual. These towel bibs can be made in any size and can even be made from bath towels if you would like them that long. Great use for the adult special needs person and children. Takes about an hour to complete depending on how much detail embellishment time you put into it. My stepdad is 91 and has Parkinson's and often has a hard time "hitting the hole" when he eats. I'm going to make him a couple of these with some sort of "mannish" theme. He usually has a bath towel draped around his shoulders and it slides and still makes a mess. Thank you so much for the idea!